Join us for the final installment of our spring series of guest artists as PVCC Music welcomes songwriters Jon Iger and Randy Brown. Jon and Randy will present Songwriting Tips From The Trenches, discussing songwriting tips and techniques, resources for songwriters, and the Arizona Songwriters Association, a group started by Jon in 1977. Jon and Randy, Arizona Songwriters Association members, have had songs placed in many movies and TV shows with major label cuts on MCA and Capitol Records and have taught songwriting at the annual Arizona Songwriters Gathering, the Musical Instrument Museum and are co-hosts of the ASA Songs in Progress Workshop, happening the 3rd Saturday of each month at the Glendale Public Library. The music department at Paradise Valley Community College is pleased to present an exciting series of hands-on musical opportunities for students, staff and members of the community. All events in this series are FREE and only require an interest to learn something new and have fun. 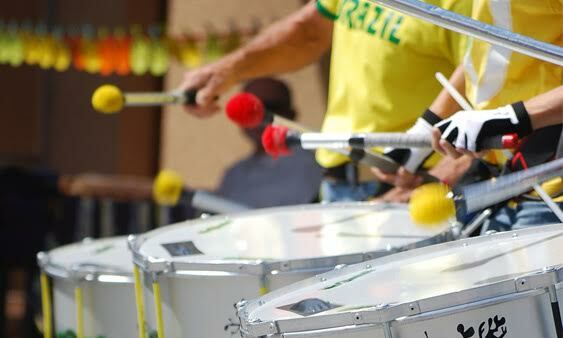 Learn to play, sing and dance to the exciting rhythms of Brazil. All drums provided. June 7th: The origin of film music. Why music? For additional information about the NO EXPERIENCE NECESSARY events and workshops, please call (602) 787-6596 for information, or e-mail music@paradisevalley.edu. Are you a fan of Synthesizers or Electronic Music? If so, join us in the Center for the Performing Arts at Paradise Valley Community College to meet fellow synth enthusiasts at the PHOENIX SYNTH MEET on Friday, February 16th. Showcase/Open House for people to share, play, and explore synthesizers of all shapes and sizes. The event is free to participate and to attend. Synth enthusiasts are invited to bring their own rig and share or to come and support the Synth scene in Phoenix! A Food Truck will be on-site for concessions and snacks, so plan to spend the entire day with us for this exciting event. The PHOENIX SYNTH MEET is presented in collaboration between PVCC's Commercial Music Program and the Phoenix Synthesizer Group. The Music Department at PVCC is pleased to offer two FREE World Music Workshops to students and the public this spring. On Tuesday, January 23rd and Thursday, January 25th join PVCC Instructors Samuel Peña, Joseph Goglia and Josiel Perez for a no-experience-necessary World Music experience. With all equipment provided, the workshops offer a hands-on introduction to the ensemble experience at PVCC. Talented musicians Samuel Peña and Joseph Goglia will lead a drum and percussion workshop focusing on the music of Brazil. No Experience Necessary. Drums will be provided. PVCC Latin Jazz instructor Josiel Perez will lead a workshop focusing on various styles in Latin Jazz! No Experience Necessary. Drumset, Congas, Amps, and Piano will be provided. PVCC has received a grant in the amount of $5,100 to create a new program just for Veterans in the community and their family members (over 18) that will provide an opportunity to explore ceramic art techniques and avenues of expression starting September 9, 2017 through May, 2018. The program will meet in the PVCC Ceramic studio in D building and will be conducted by David L. Bradley, PVCC residential faculty and Frank Krevens, MFA, PVCC adjunct faculty. The program is a collaboration between PVCC and Arizona Artists Guild. Arizona Artists Guild has hosted an arts program for Veterans since June, 2014 to provide artistic experiences and knowledge to Veterans in our community. The program is free but space is limited. October 15th will be an exciting day at PVCC! Saturday Concert Series with Grupo Liberdade and Queso Good food truck at 6:00pm. Grupo Liberdade is a performance group dedicated to freedom of expression through Culture, Movement & Sound. We promote COMMUNITY, DIVERSITY & EMPOWERMENT drawing upon the traditional & contemporary rhythms of Brazil and beyond while bringing an original sound & energy to our desert metropolis. Specializing in Batucada including the Afro-Brazilian styles of Samba, Samba Reggae, Côcos and Maracatu, Grupo Liberdade strives to share the infectious sounds of Brasil with Arizona to further enrich, move & inspire. Since 2004, the group has performed throughout Arizona under the direction of Brazilian native, Poranguí from leading the Annual Phoenix Parade of the Arts through downtown Phoenix, to drumming & dancing in the new year for thousands of party-goers at the historical Hotel Congress in Tucson. Founded in 2008 by Angelique Starks, the SambAZ Dancers have quickly become one of the liveliest and most notable Samba acts in the country. Dedicated to creating music to move the body & soul, this project brings together diversity on all levels with an incredible show of talented musicians & dancers that must not be watched, but experienced! On Saturday, October 15th Paradise Valley Community College’s Center for the Performing Arts (CPA) will host the Fine Arts Open House. This free event features demos, performances, tours, workshops, and hands-on activities. Music, dance, theatre, costume design, creative writing, film, and studio recording are among the fine and performing arts programs that will be showcased. Information about classes, programs, events, scholarships and performance opportunities will be available, and those in attendance will be treated to a variety of special performances and workshops throughout the afternoon. The music department at Paradise Valley Community College is pleased to present a new series of hands-on musical opportunities for students, staff and members of the community. All events in this series are FREE and only require an interest to learn something new and have fun. Learn to play and dance to the exciting rhythms from Brazil. All Drums provided. Joe Goglia and Samuel Peña instructors. Learn techniques in Studio Recording, Electronic Music and more! Brett Reed, JCK Music / John Keenan, and Tsone (Tony Obr), instructors. All styles of music, spoken word and poetry are encouraged. Performers will need to sign up at 6:00pm to perform. Join us this summer for free concerts, music workshops & our summer musical! Featuring a presentation by PVCC graduate Jonathan Lucas (US Army 2004-2012), and musical performances by the Salt River Brass Quintet, PVCC music student Rachel Brown, and vocal soloists. Donations will be accepted for the PVCC Veteran's Student Scholarship Fund. Featuring performances of small jazz ensemble music ranging from classic jazz standards to modern jazz. Audience members are invited to bring a folding chair or blanket for seating. Music Technology Workshops focusing on techniques in Studio Recording, Audio Mixing, Electronic Music and more! irty Rotten Scoundrels by Jeffery Lane and David Yazbek directed by Andrea Robertson. Based on the popular 1988 MGM film, our summer musical takes us to the French Riviera for high jinx and hilarity. Lawrence Jameson makes his lavish living by talking rich ladies out of their money. Freddy Benson swindles women by waking their compassion about his grandmother's failing health. After meeting on a train, they attempt to work together only to find that this small French town isn't big enough for the two of them! Show Dates: June 17, 18, 24, 25 at 7:30pm and 19, 26 at 2:00pm. *4 additional ticket fee at the door 1hour prior to performance.